Enhancing oxygen delivery and alkalinizing your system by using Oxy-Pure allows the body to fight infection, eliminate toxins, and to have the combustion (fat-burning) and energy-producing benefits that come from the life-giving chemical: oxygen. Optimal OxyPure is now formulated with a guaranteed 35% oxygen strength. Oxy-Pure has 350,000 parts per million of dissolved bioavailable oxygen. Oxy-Pure is the strongest oxygenating formula that can be manufactured creating an oxygenated internal environment allows the body to better fight infections and viruses as well as eliminates toxins. It is the strongest oxygenating formula legal to be manufactured and sold for human consumption. Oxy Pure is independently tested to be antimicrobial. Due to their cellular structure, pathogenic (disease-causing) microbes give up electrons and die when exposed to oxygen-rich environments. Basically, the disease-causing microbes are anaerobic and thrive only in an environment deprived of oxygen. These include anaerobic bacteria, virus, yeast, fungus, mold and parasites. Beneficial microbes, however, are basically aerobic and thrive in an oxygen-rich environment Using an aerobic stabilized oxygen product like Oxy-Pure can increase the oxygen within the body which is what it needs to defeat these harmful invaders. Many times Oxy-Pure drops are consumed in order to elevate the levels of oxygen in a person's bloodstream, or to be applied topically. 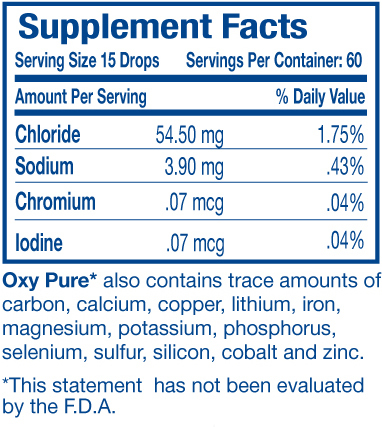 Others use Oxy-Pure to help with water cleansing and purification. Doctors and consumers have reported using Oxy-Pure to oxygenate the body for helping with: cold, flu, infection, rash, shingles, alkalinization, candida, bug bites, improved aerobic performance, skin oxygenation, immunity, athletes feet and overall health through oxygenation. Top sellers on the market of actual oxygen products usually have 4% stabilized oxygen. If they sell the old technology sodium chlorite product, they can't give you an oxygen amount because it doesn't exist until it reacts in the body and regulations make it questionable to sell for human consumption. POLYATOMIC TETRAOXYGEN OR 04 OXOZONE Oxy-Pure drops are an O4 concentration that is comprised of four oxygen molecules. The concentration is suspended in a solution that does not have much of a taste, yet is able to maintain the concentration for several years. There are no chemicals used, so it is perfect to ingest. Oxy-Pure is created by combining distilled water with minute amounts of a saline solution derived from pure food-grade sea salt. This is done to increase electrical conductivity and facilitate the process that separates the oxygen molecules from the H2O and stabilizes the oxygen in the water. This mixture is then put through a proprietary electrolysis process which produces the 04 oxygen molecule that is bio-available. The result is a very high concentration of "MEASURABLE" 04 oxygen, safe pH levels and a formula that doesn't have to be diluted. Oxy-Pure consists of 35 percent stabilized oxygen and does not have any dangerous hydrogen peroxide or chemicals. OHS formulator's brought the first liquid oxygen product to the market over 25 years ago. It was based on the chlorine dioxide technology using sodium chlorite. It was a great product but had a few draw backs. The first was that the pH levels were very high ranging up to 13. You had to dilute the formula down to 7-8 pH in order to use it. Second, research shows that the product created a chemical reaction in the body to create oxygen but there was no way to ensure exactly how much oxygen was created and it obviously differed from person to person. SERVING SIZE: 15 drops in 4 oz. of water 3 times a day, or as needed. Best if used 30 minutes before or 1 hour after meal. May be taken sublinqually or used topically. Shake well before use.